Our children have extraordinary potential. We enable them to fulfill it. Life for low-caste villagers in rural India is a vicious cycle of oppression, kept in motion by illiteracy and lack of opportunity. Many of our children would have been destined to follow in their parents’ footsteps if not for Shanti Bhavan. With our support, they have overcome enormous challenges and excel inside and outside of the classroom. Get to know some of our students! 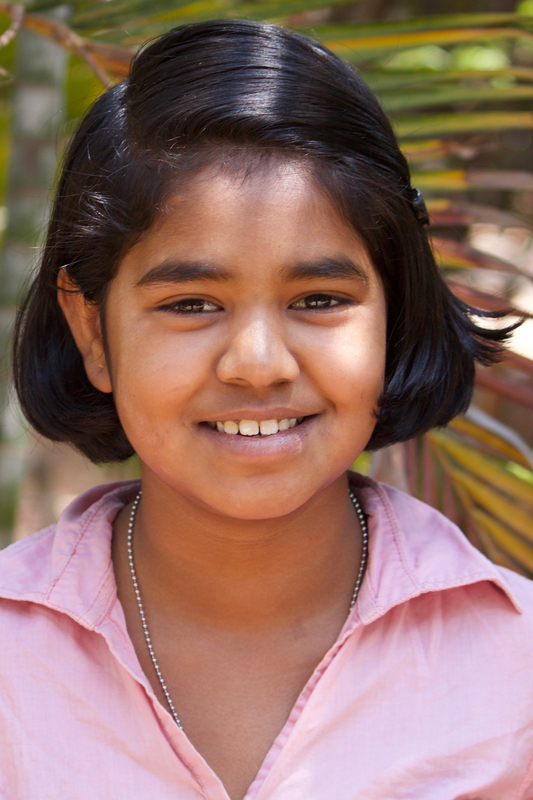 Thenmozhi, also known as Thenm, is in the seventh grade at Shanti Bhavan. Her favorite classes are Chemistry and Biology classes, and when not in class she can always be found on the soccer field improving her footwork with friends. Thenmozhi is originally from Krishnagiri, in Tamil Nadu. Her ten-year-old brother attends a government school and has a part-time job cutting banana leafs for weddings. Her older sister was in school until the tenth grade and is now a housemaid for many families in their village. When Thenm was just a baby, her father committed suicide, leaving her mother as the family’s sole caregiver. When Thenmozhi is home, she helps her mother at her job in a matchstick factory, and also picks jasmine in the middle of the night to sell in Bangalore. 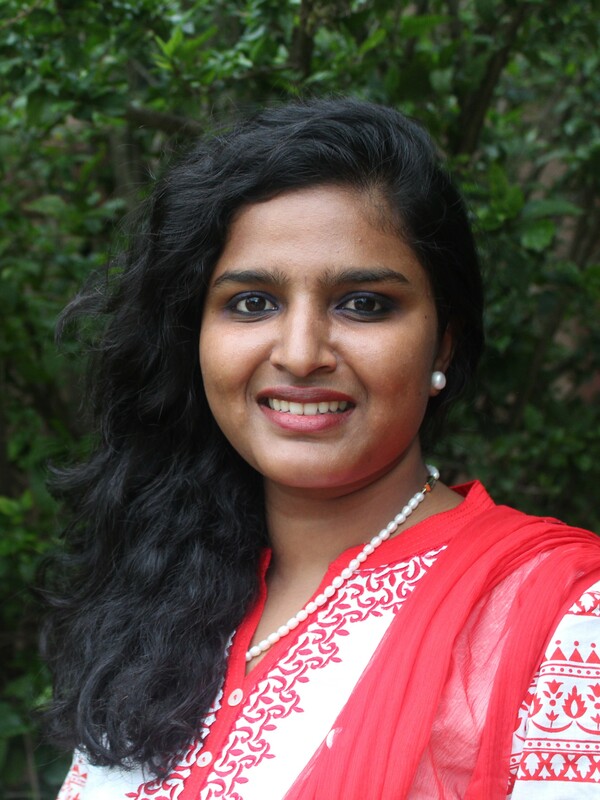 For Thenm, Shanti Bhavan is the gateway to realizing her dreams. If she were not studying, her family would require that she drop out of school after tenth grade to get married. She wants to fulfill her family’s wish of taking care of her siblings, and also her own goal of becoming a veterinarian. Although school is hard work, Thenm loves being at Shanti Bhavan because of the wonderful warmth and joy she feels on campus. Thenmozhi values believing in yourself and never defining another by their career or their appearance. At Shanti Bhavan, she has also learned that working together for a common goal will improve the world around you. 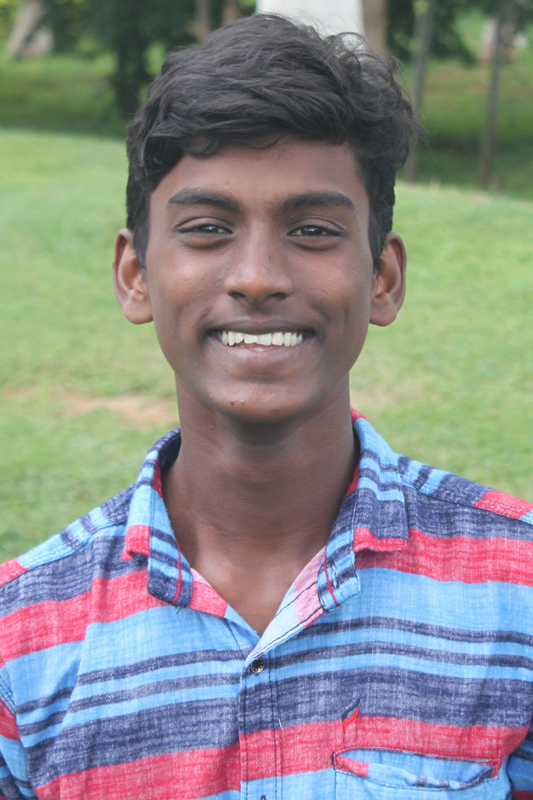 Shanmugan, also known as Shan, is in the ninth grade at Shanti Bhavan. 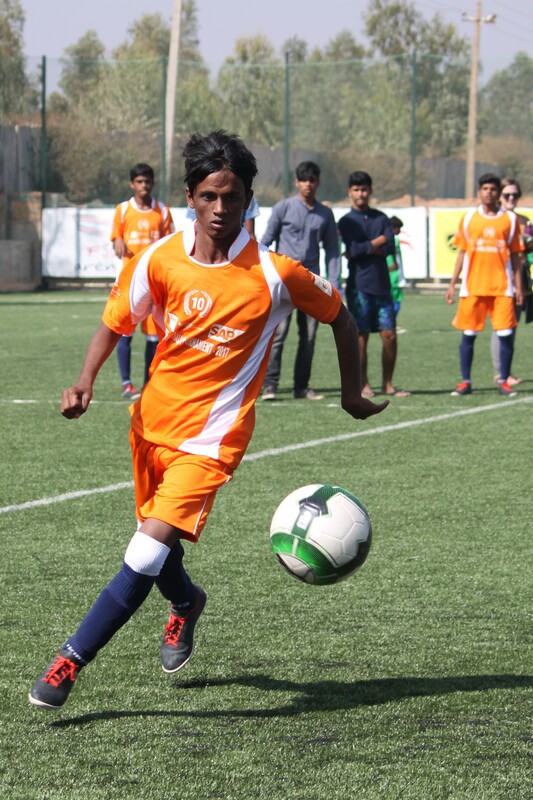 He loves to play soccer and is the youngest member of the Shanti Bhavan soccer team. He likes to spend his free time reading spy novels and sketching tattoo designs. Shan’s family currently lives in Pondicherry, but they travel constantly in search of work, sometimes for weeks at a time, carrying their tent with them when they move. His family has been in the profession of digging wells for generations. Both of his parents, his sisters, and his elder brother start work at four in the morning and continue until eight at night. Two of the strongest values Shan has learned at Shanti Bhavan are to help others before yourself and to always be humble. 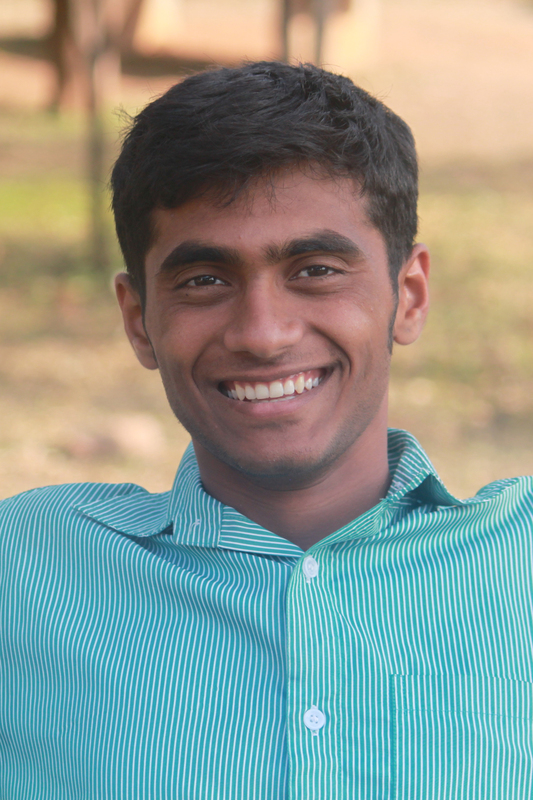 After graduating, Shan intends to get a job in finance at a company like Goldman Sachs, in order to help his family and give back to Shanti Bhavan. Regardless of where Shan ends up, he vows to always act with humility, and object when people make others feel less than themselves. Whenever Shan’s classmates are struggling, he always reaches out a hand to help. James is in eleventh grade at Shanti Bhavan. He enjoys playing goalie on the Shanti Bhavan soccer team and singing in the school choir. James is originally from the center of Bangalore, where he shares a home with his parents, two siblings, and older cousin. When James was very young, his father had a terrible accident and was left bedridden. His mother was working as a housemaid at the time, but her salary alone was not enough to fully support the family. James’s 11-year-old brother and 14-year-old sister were forced to drop out of school and find work. His brother works long hours as a carpenter, from eight in the morning until late at night every day. His sister works in a clothing factory and is also responsible for all the housework when she returns home late in the evenings. Last year, James’s father had another accident and injured his knee, which has again left him disabled and unable to contribute to the family’s income. Through Shanti Bhavan, James has learned the value of education. He hopes to invest in opportunities for his siblings one day just as Shanti Bhavan has invested in him. James is currently studying Business and aspires to start his own company. James is working hard to prepare for college; he would like to study Finance and International Affairs at a top university in Bangalore. James knows that through hard work, coupled with the support of the Shanti Bhavan community, his dreams will be realized. Shiney is in the twelfth grade at Shanti Bhavan. She is studying science and enjoys all of her classes, especially Biology. Shiney wants to become a pediatrician because she loves working with children and especially delights in spending time with the new preschoolers at Shanti Bhavan. Shiney is originally from Bangalore and lives with her mother and stepfather. When she was just two years old, her father was fatally electrocuted in a factory accident. Her mother wanted to raise her as a single mother but was given a grim ultimatum by her family—either remarry a relative, or commit suicide. She chose to remarry, knowing it was the best option for Shiney. Shiney’s new stepfather is very hateful towards both her and her mother. He is not only abusive but also doesn’t support the idea of Shiney’s education. Shiney believes that studying science is very important not just for her own career goals—she hopes to be a role model for other girls in the community so they will be more inclined go to into STEM fields. In addition to pursuing medicine, Shiney wants to work with children with mental or physical disabilities. One of the strongest values she has learned at Shanti Bhavan is to be selfless and to help others before yourself, and this is a tenet she will carry with her throughout her life. This past March, Shiney traveled to the United States to be a spokesperson for Shanti Bhavan at Tufaan Entertainment, a large South Asian dance competition at Northwestern University in Illinois. She told her story to an audience of over 1,000 people. She also went to New York City and spoke at a She’s the First event. This was an incredible growth opportunity for Shiney, one which broadened her view of the world and made her a more confident and capable young woman. Kishore is in the twelfth grade at Shanti Bhavan. He is currently studying Business and wants to become a head manager at a tech company like Apple. One of his favorite things to do at Shanti Bhavan is to manage all of the technology, especially organizing components such as music, sound, and lighting for performances. Kishore is from Bagalur, a small town outside of Hosur. His father was in school only through the fourth grade, when he quit his studies to take a job cleaning busses. His mother did not receive an education, instead taking up housework at the age of six. After Kishore started at Shanti Bhavan, his father fell off a greenhouse while working as a mason, and was bedridden for a year. His mother stayed at home to care for him, leaving the family without an income. During this year Kishore’s younger sister, Shirisha, was born. Two values Kishore appreciates are taking responsibility for one’s actions and being a leader. Over the years at Shanti Bhavan, Kishore has strongly adhered to those standards; he is one of the most responsible students in the higher grades and a strong role model for the younger students. This past year, his leadership skills earned him the honor of speaking at Tufaan Entertainment in Chicago, Illinois, with his classmate Shiney. This was a wonderful opportunity for Kishore to not only be a strong representative for Shanti Bhavan but also to grow immensely as an individual. Janani is in the twelfth grade at Shanti Bhavan. She had a fantastic junior year, full of personal growth and leadership opportunities. Janani is studying science and especially enjoys her Computer Science classes. She hopes to become an engineer when she is older because she loves learning and understanding about how day-to-day devices are made. Janani is from the town of Ooty in the state of Tamil Nadu. Her father is a house broker but also an alcoholic. Her mother, a housemaid, saves whatever small earnings she makes to pay for food and education for her family, while her husband spends all of his income on his addiction. Janani knows that the education she is receiving at Shanti Bhavan is the most important thing for her family. Her primary goal has always been to make enough money to pay for her younger sister to go to medical school. Tragically, her sister passed away suddenly in early 2017, at the age of fifteen. Shanti Bhavan has taught Janani to dream for herself, and to not simply follow the plans others decide for her. She has developed her own voice, and now carries with her an outspokenness that is an inspiration for other students. Vinceya is a recent graduate and, at just 22 years old, embodies the success Shanti Bhavan students can expect to achieve. In June 2016 she graduated with a bachelor’s degree in Business Management from St. Joseph’s College of Commerce, Bangalore. She is now working on Amazon’s Product Investigations Team. Vinceya’s father is an auto driver and her mother is a housemaid. They are both suffer from diabetes and her father has needed multiple surgeries on his spinal cord. She is the sole financial earner for her family and takes on all of the expenses of the home, including provisions, rent, medical expenses, and her brother’s college fees. And because her mother is ill, as a girl she is also expected to do all the cooking, household chores, and family duties. Her ambition is to provide a comfortable lifestyle for her family, and to help others like herself who are in need. Vinceya’s dream is to build temporary shelters for the homeless, help them discover their talents, and teach them the skills to succeed. She believes that this will help them to live independently and with dignity. Born into a poor rural village that engaged in brewing and selling homemade liquor, Shilpa witnessed crime, domestic violence, alcoholism and poverty from a young age. Her father, then an illiterate bootlegger and now an elephant chaser, sent her away at the age of four to a free residential school called Shanti Bhavan. He hoped that she would receive a good education, empowering her to live a life different from his own. Shilpa is the first in her family to finish high school. She completed Bachelors in journalism and Masters in Psychological Counselling. In a village where girls are often married off at a young age, with little or no encouragement to study, Shilpa is an inspiration and a source of pride for her community. Shilpa’s desire to study psychology was borne out of the sudden death of her younger sister who committed suicide at the age of fourteen. This tragic loss stimulated her interest in helping children struggling with complex emotional and psychological distress, which is often exacerbated by conditions of poverty. She is currently working at Spastics Society of Karnataka where she counsels the families of children with autism and other major developmental disorders. Shilpa recently published her first book, a memoir titled The Elephant Chaser’s Daughter, where she offers a first-hand perspective of what it is to be a part of the social underclass in modern-day India. Over the course of her life’s journey, she has navigated between two worlds: one of hardship, servitude, injustice, and oppressive traditions; and the other of opportunity and empowerment. Her story is featured in the upcoming Netflix docu-series, Daughters of Destiny, directed by Oscar winning filmmaker, Vanessa Roth. 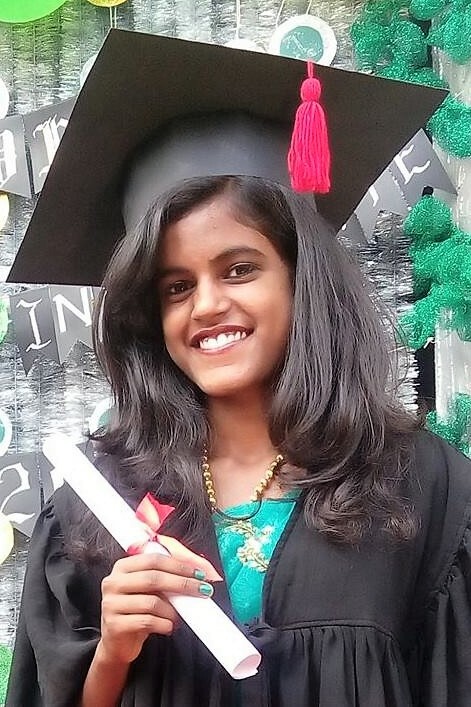 Meet Maheshwari on her graduation day from Shanti Bhavan, in 2015. 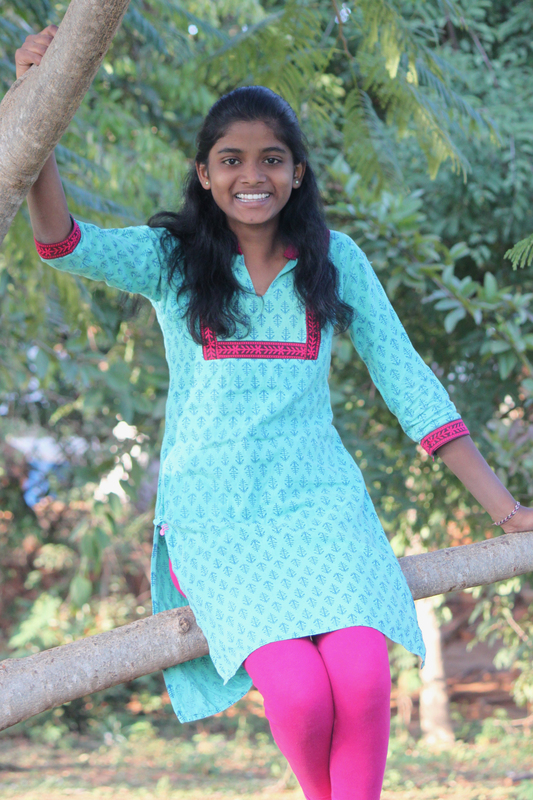 The first in her family to receive an education, Mahesh is now studying for her masters in Applied Genetics. 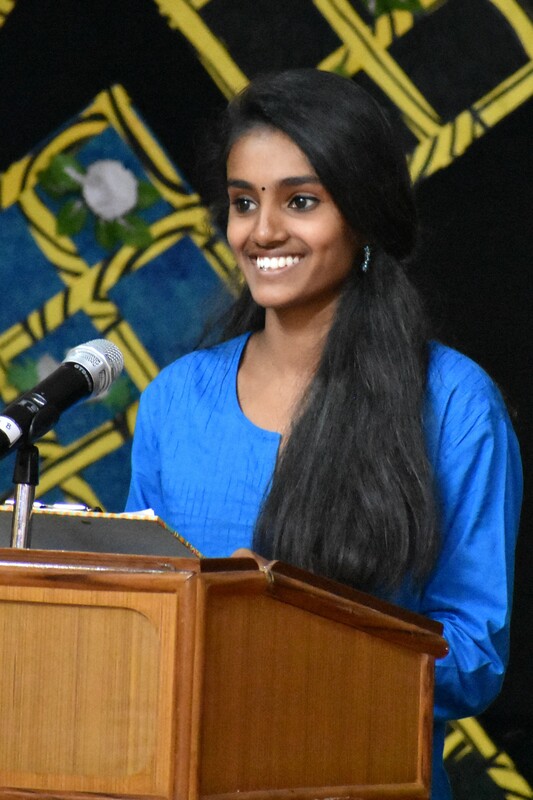 Rasiga, now starting her second year of college, shares what it’s like growing up at Shanti Bhavan, what the school means to her, and how she’s studying to one day be a software engineer.